Gone are the days of hopping in the car for a quick trip to... well, anywhere! I need to be prepared to feed, change and entertain; to handle the occasional blowout. You know what I'm talking about. We keep the diaper bag fully stocked and ready to go alongside the car seat and keys near the front door. More and more days I find myself fresh and fully dressed (yay!) so we've been running errands, visiting people... basically, living. I love "What's In My Bag?" and used to participate years ago when it was a clutch I was carrying with some lip gloss, my debit card, and ID. Oh. When was that? Last year you say? That's right! Moving on.. to bigger and better things! 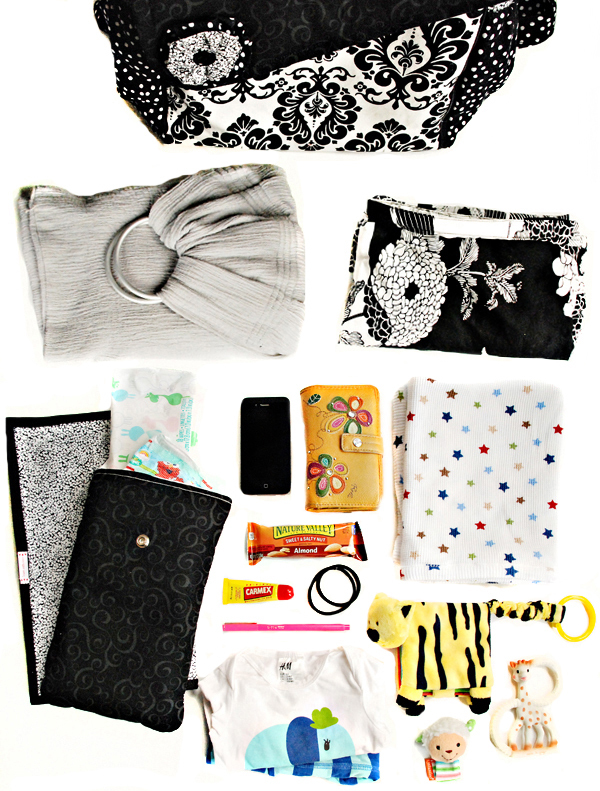 So here is "What's In My Bag? Diaper Bag Edition" with a six week old baby. I'll revisit this from time to time to document how these contents change as he gets older! 1. My mom made the most awesome custom diaper bag and gave it to me at my baby shower. You can catch a glimpse of it at the very bottom of this post. I love that it's so spacious with lots of pockets for storage. You can also change the strap from a purse to a backpack which is perfect for me when I'm on my own. I'll be posting more photos and information soon because she's going to be selling them on Etsy! 2. We always bring a carrier with us. For trips where he's going to be out longer we take the Moby Wrap. He naps longer and more comfortably in that wrap. 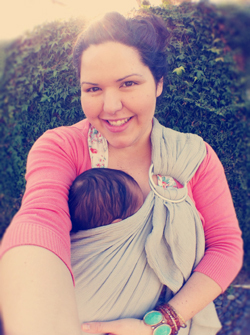 I just purchased this ring sling from Raspberry Baby in grey. I wanted something that was quicker to put him in and I absolutely love the color and fabric. She has a lot of great colors available now for Spring so make sure to take a look! (*Please note that Benjamin could breathe! His head slid over when I was trying to take this picture.) More on babywearing soon! 3. We have the "Yoko" Bebe au Lait nursing cover. You can see it in use here. Most of the time we don't use a cover. It can complicate things. However, it's come in handy when we've nursed in a movie theater and in the car during the day. 4. Along with the diaper bag my mom made a matching changing pad and diaper/wipes case and I'm sure to keep that stocked. Note to self - make sure diapers are the right size! 5. Personal items - my iPhone, wallet, Carmex, hair ties, my favorite pen, and snacks. I usually keep several in the bag along with a water bottle. My current obsession are the Almond Sweet + Salty Nut Bars by Nature Valley. Oh em gee. Delish. 6. A blanket for either lying him down or swaddling him. This is a thin, stretchy blanket which is great for swaddling. My personal favorite baby blankets are the aden + anais muslin blankets. I just read that they're making blankets for adults now too! Swoon. 7. An extra outfit is a must! We switch it up often because he's growing so fast right now. I try to stick to things that are light and comfortable. Right now it's this adorable elephant outfit from H&M kids that his godmother bought him. (You can see Benjaimin in it here.) I seriously love their kid's clothes. 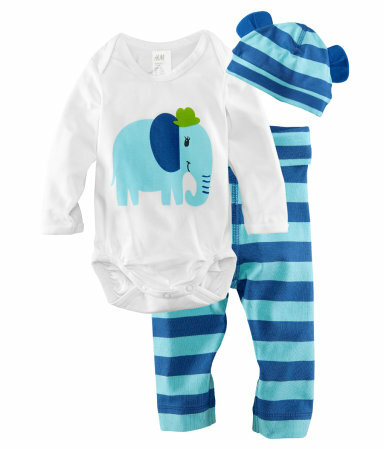 So stinkin' cute and still affordable! 8. He is starting to pay more attention to his toys now so we bring a few along. I don't think he necessarily cares about them as much as my smiling face while I try to interact with him but that's good too.